Detachable Spout Pouches can be manfactured in a wide range of barrier films. Specific film recommendations can be made to best suit your application. Registered printing up to 10 colors is available on the front and a 10 color random print is available on the back. 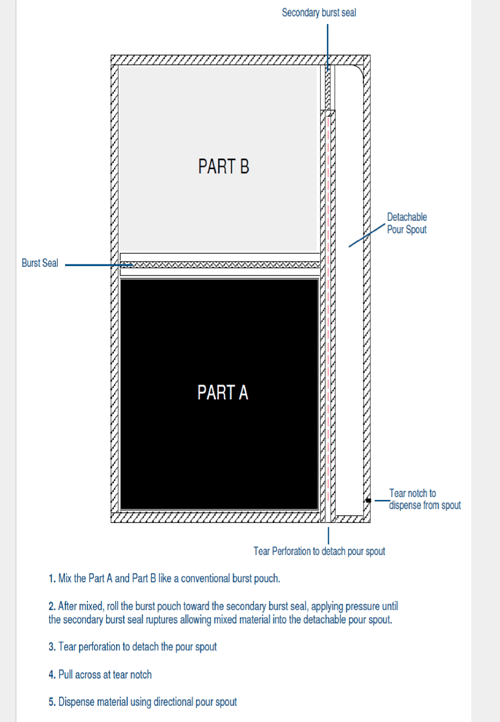 Pouch design is free upon request. These innovative frangible seal pouches are designed for applications which require the use of a directional spout to dispense your two component epoxy, urethane or silcone. All Detachable Spout Pouches are custom and are available in sizes of 4" x 4" up to 18" x 20".